As 2018 drew to a close, more than 100 academics and commentators in China shared their candid reflections on the 40 years since the country’s economic reforms, in an article posted on social media. However, the post was met with swift censorship by the communist regime. While quickly taken down by censors, the article was widely shared among Chinese netizens. Many of the intellectuals called for freedom of speech and expression, greater economic liberalization, and free elections, while others spoke of the death of reform in China. 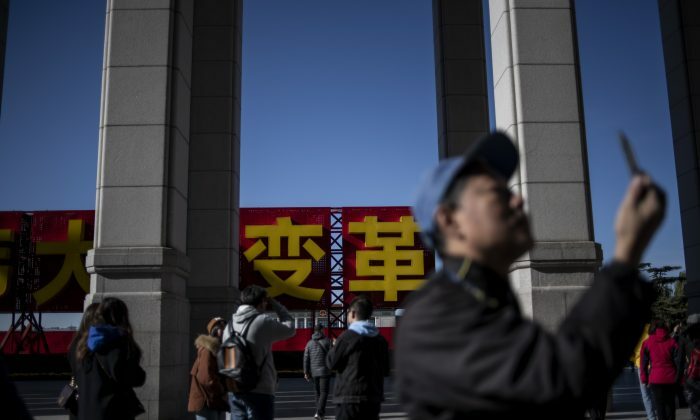 Those that made statements were professors from China’s top universities such as Beijing University and Tsinghua University, former judges, and figures in the media industry. While Chinese leader Xi Jinping championed development along socialist lines in a Dec. 18 speech marking the 40th anniversary of economic reforms, the academics and commentators offered alternative perspectives on the paths to real reform. Freedom of speech and economic liberalization were emphasized by several commentators. “Reform is not only about ensuring the people do not go hungry, people also have to dare to speak, and not be afraid to speak out!” said Beijing political commentator Cai Shenkun. “Reform is about policies that protect private property rights and foster a free market economy. Reforms should lead to an increase in people’s freedoms,” said former judge and lawyer Chen Tianhua of Zhejiang Province. Other intellectuals highlighted the need for rule by law and free elections. “We need an end to the so-called ‘reforms’ that have produced anti-market and anti-rule of law policies, and establish a country with real market economy and rule of law. To do this, we need to develop a new liberalized intellectual movement to create a ‘new reform and opening up,'” said Hu Xingdou, a professor at the Beijing Institute of Technology. Zhang Qianfan, a constitutional law professor at Beijing University, said: “Every problem in Chinese society, particularly the erosion of human rights and rule of law in recent years, is fundamentally a result of the lack of real elections. For some academics, the only solution to China’s problems is to revamp the political system. “The only real reform is reform of the political system. The only real opening up is an opening up of ideological culture,” said Zhang Shuguang, a professor at Beijing Normal University. “The future of China will always lie in limiting the power of government and a strong civil society. Reform is dead, it is time for constitutional government,” said Zhao Guojun, a scholar from Beijing. The article came one day ahead of Xi’s new year address, in which he again pledged the continuation of the country’s reform policies. “Our pace of reforms will not stagnate, and the door to opening up will widen further,” Xi said on Dec. 31. The address did not include concrete details of any future reforms. Chinese Premier says China should consider political reform.